Or how the Cryptocurrency market came of age in September 2017. On Monday 4th September the Chinese Government announced that it would officially ban all Bitcoin trading and that from then on any more companies attempting to raise money through an ICO would be breaking the law and that all the money that had been raised must be paid back. Rather than fall foul of the law, domestic Chinese investors were quick to get out of the market (publically at least) and the price of Bitcoin began its most dramatic fall yet. From Monday 4 September to Friday 15 September, Bitcoin lost $1,600 in value, falling 35% from $4,550 to $2,950. If you take into account its all-time high of $4,900 on Friday 1st, the drop in value was even greater at $2,000 a Bitcoin, a 40% drop in value. 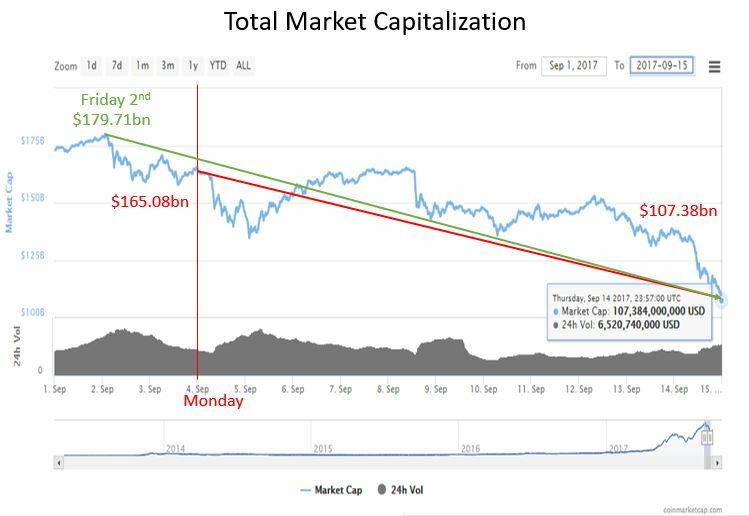 Because Bitcoin still dominates the cyrptocurrency market, the total cyrptocurrency Market Cap also experienced a massive drop, losing 34% of its value from 4 September to 15 September. 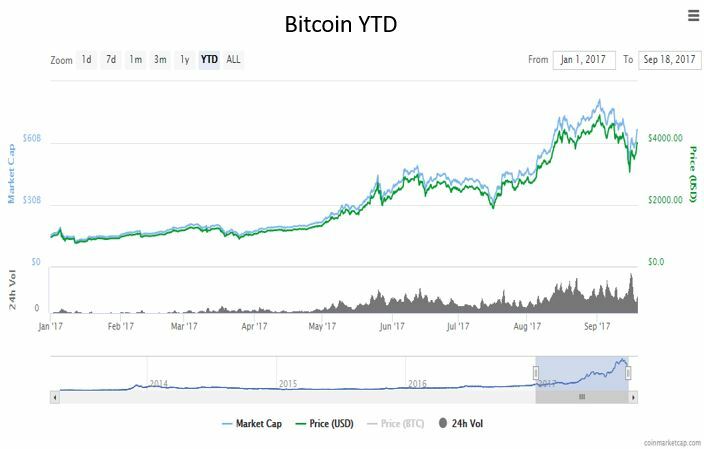 As you can see from the graph, the price of Bitcoin had sky-rocketed up 300% since January, so it’s easy to understand where the panic has come from. The prognosticators of doom and the “Tulip Bulb” brigade were quick to follow up on the plunge, seeing it as a vindication that Bitcoin was nothing more than a dangerous market bubble. High profile industry figures with decades of experience watching all kinds of market activity then joined in the attack, with JP Morgan’s CEO Jamie Dimon declaring that Bitcoin was “stupid” and that it would “blow up” (Wednesday 13 September). 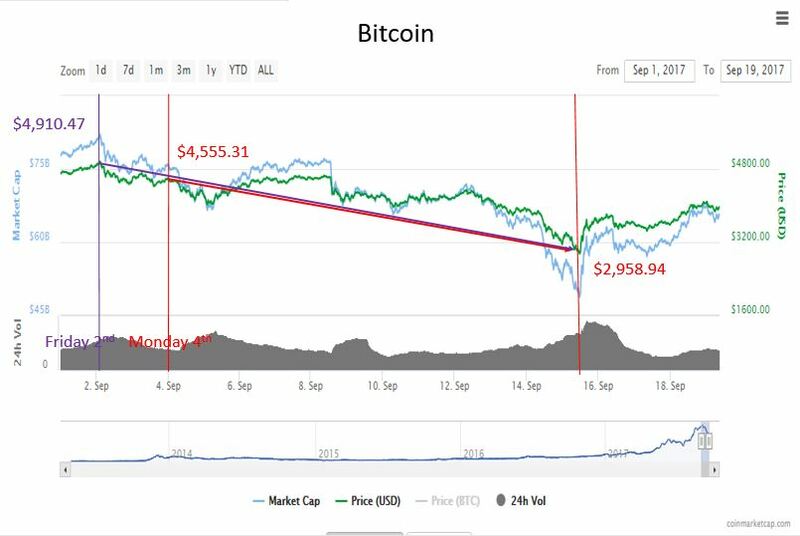 But since it’s trough on Friday 15 September, the market has quickly recovered, regaining 50% of that loss to $4,000 today (Tuesday 19 September). No matter whether you see Bitcoin as fools’ gold or a new market here to stay, what happens to the market next is going to be interesting. Let’s look at where Bitcoin, and the total cryptocurrency market, has come from. Since 2013 the price of Bitcoin has risen from $135 to $4,000 a share today. But it hasn’t been one smooth logarithmic rise, in fact apart from a dramatic peak at the end of 2013, the previous 3 years have been active, but fairly steady, only moving $970 to $960 from January 2014 to December 2016. During which there were roller coaster price spikes and sustained periods of price stability (Bitcoin stubbornly remained at the $240 mark for Q2 and 3 of 2015) but nothing that compares to what has happened since January. Since January this year the price of Bitcoin has risen by 300%, from $936.66 per coin to $4001.36 today. And the total cyrptocurrency Market Cap has gone from $17.86bn to $138.01 today, a 700% increase. Which begins to explain where all the attention has come from. The Bitcoin market, and cryptocurrency in general, has gone from curiosity to major force on the world stage. Prompting a summer of tales where middle Americans bought swimming pools and exotic holidays on the back of their part-time Bitcoin hustles, and the US and Chinese Governments weighed in with vociferous intentions to try to regulate this market. Well, just like a share in the stock exchange, a Bitcoin represents two things, it’s a representative of a tangible asset (in this case a unique cryptographic Hash which can only be generated by “mining” a pre-set number of server calculations) and it’s one unit of a financial class that’s value will go up and down according to demand. And in the same way that companies would traditionally raise investment capital on the stock exchange through an Initial Public Offering, today companies can also raise investment capital by creating their own cryptocurrency, mining a pre-set number of coins (or tokens) and attempting to sell them in one go during an Initial Coin Offering. So the cryptocurrency market operates according to a very similar set of parameters as a traditional asset class in the financial markets. Some of these companies, like Bitcoin and Litecoin, are designed purely to be a digital currency to be traded across the internet without regard for national borders. But an increasing number today are using the ICO, not as a way to turbo-charge the starting value of their currency, but instead as a mechanism to raise investment capital for Blockchain related software solutions, the best example of which is Ethereum. And it is this sector of the market which represents the “Blockchain revolution”, these companies are the ones that are spearheading the paradigm shift that Blockchain technology will initiate which so many technology pundits have been talking about. 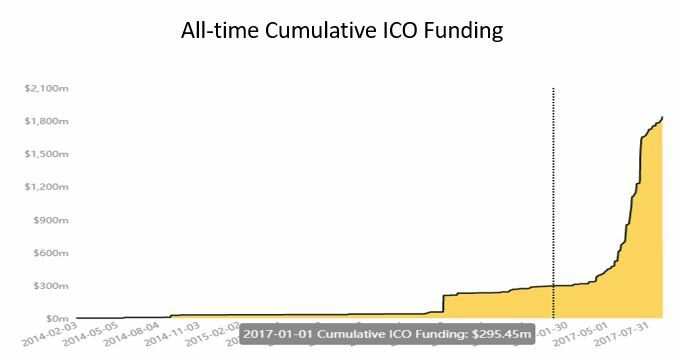 If you look at how both the number of ICOs, and the level of ICO investment, has sky-rocketed since January 2017, it’s clear to me that this year’s activity in the cryptocurrency market is very far from a “bubble” and instead there are many signs that this market has come of age. Another sign of health in the market is how alongside the increase in total investment, investor numbers and variety of cryptocurrencies; the market share has also begun to significantly diversify. 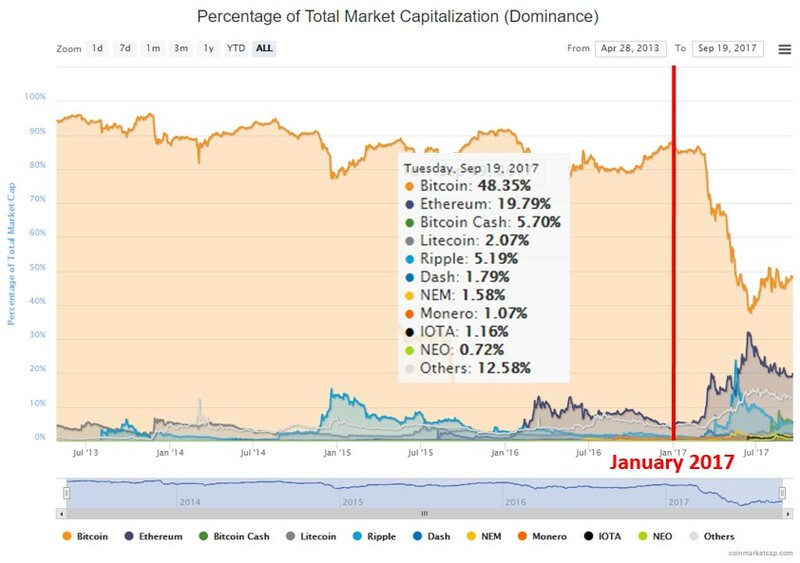 This year Bitcoin has gone from dominating the market with a continuous 80-90% market share, to a 50% market share, sitting alongside Ethereum (20%) and Bitcoin Cash and Ripple (5% each). This new diversity in market share is a sign that the market is in rude health. The peak Bitcoin price of $5,000 may well turn out to have been a bubble in the short-term and despite its recent recovery, the price might not return to the $5,000 value for months but pragmatic financial stakeholders like the US and Chinese Governments, recognise that with a value of $138 billion, cryptocurrency is now a major element of the global economy. And grey-haired technologists know why. 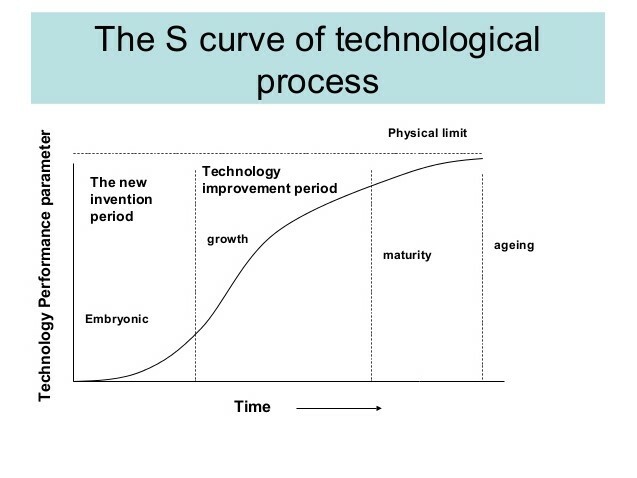 For decades it’s been understood that each new technology evolves along the lines of an S-curve trajectory. The first stage features very little growth as the founding concepts and tools are established, technology adoption then enters a rapid period of adoption in a transitionary “improvement period” and finally levels out when performance reaches its physical limit. Despite our iconoclastic age, this “S-Curve Of Technological Progress” has largely repeated itself, just look at the way televisions, mobile phones, and Artificial Intelligence have each begun their existence with fragile beginnings and limited adoption, gone through a period of mass adoption and the matured after nearing peak market volume. 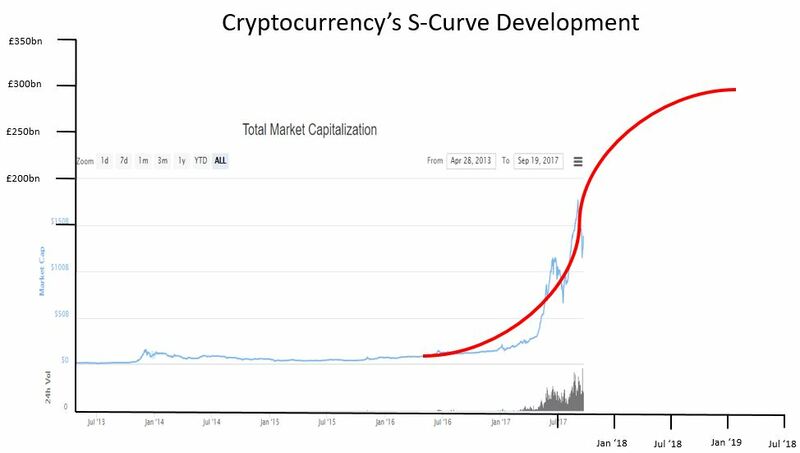 Entering the murky world of dragons, fairies and economic forecasting, I have drawn my own S-Curve onto the cryptocurrency total market cap to see what it might look. 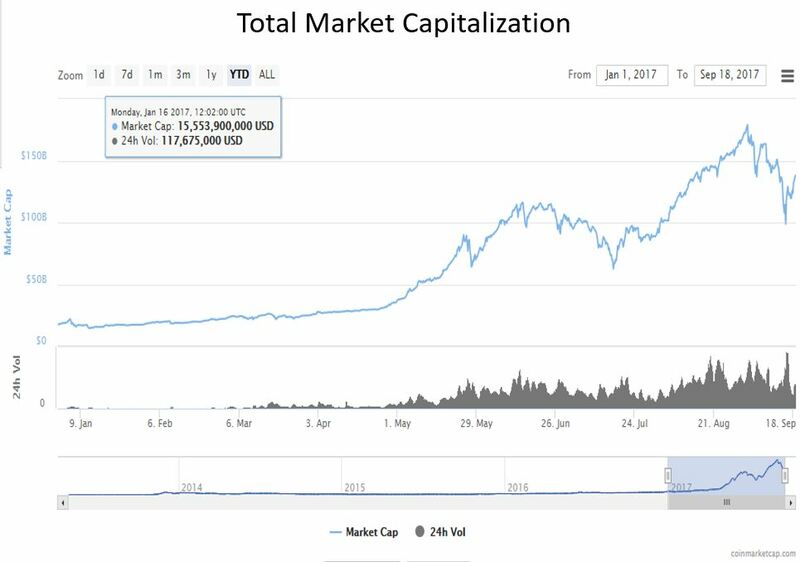 My graph shows the cryptocurrency market reaching maturity at a total market cap of $300bn in January 2019. But whenever the cryptocurrency market reaches maturity, it has not reached it yet. National Governments will not put the requisite time and effort required to “kill” off the sector, attempts to regulate a supra-national peer-to-peer network is currently too complicated a problem to effectively institute and in the post-2008 heavily regulated financial markets, investors are keen to find an investment vehicle with bigger rewards. The rise of cryptocurrency has only just begun.